The Florida Project explores the power of childhood fantasy. “My soul is humbled when I see the way little ones accept their lot,” says Mrs. Cooper at the end of Night of the Hunter. “Lord save little children. 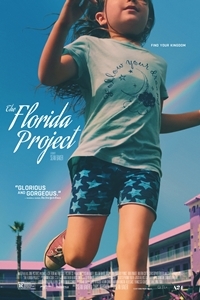 The wind blows and the rains are cold, yet they abide.” Director and co-writer Sean Baker’s lavender-tinted, tragedy-tinged fantasy The Florida Project could have taken that last bit for a tagline. And how does she abide? Through the marvelous power of childhood fantasy. The belief that she will get away with it. The belief that Mom knows best and will always provide. The belief that God is watching over her. The belief that everything will be all right in the end. And all of those beliefs — except maybe the last one — have some basis in reality. Her charm is nigh unto undeniable, whether she’s working a tourist or winning over a girl she just showered in spit. Mom (an electric and fierce Bria Vinai) certainly thinks she knows best, sometimes hilariously so, and will in fact do whatever it takes to pay the rent. Hotel manager Bobby (Willem Dafoe, letting the tenderness show through the weary exasperation) keeps a benevolent, indulgent eye on things without quite abdicating authority. Again, who can blame her for making the best of a very bad situation? There are moments of clumsy drama and exaggerated quirk, and a certain amount of acceptance is required to watch little kids go feral without arousing suspicion. But Baker loves his characters and he knows his business. Halley’s mounting desperation, full of mercurial shifts from ingratiating minx to clawing hellcat, is as sympathetic as the mounting frustration of those around her. And his frantic depiction of Moonee’s final fantasy verges on both brilliance and heartbreak.